QUESTION: I very much look forward to reading your blog every day and feel that I am learning much. I don’t know much about BitCoin but I note that it has almost doubled since the beginning of the year. Does your model have any insight into the future of cryptocurrencies like BitCoin. ANSWER: The problem with BitCoin is precisely that. It is akin to the problem that existed when the bubble burst in 1966 with mutual funds because they were listed back then. The value of BitCoin can change at a volatility rate of 10x that of the dollar, making it a highly dangerous instrument as a store of wealth. It is solely a trading vehicle until they weigh it and the value is changed. In 1966, investors bid the mutual funds up beyond net asset value so during the crash, people lost everything when they thought it was a secure investment. The net underlying assets may have dropped 20%, but they paid 20% over net asset value and then sold at 50% of net asset value. 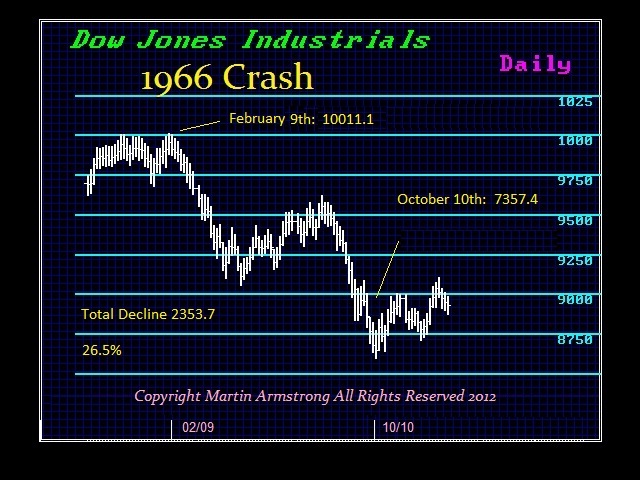 Many mutual funds crash 70-90% where the Dow drop was 26.5%. Ever since, mutual funds are no longer allowed to be listed. You go in and out at net asset value. BitCoin must change its structure or it will never become a valid currency with a stable store of value which is supposed to be the whole point. It is just an asset class of high volatility. Longer-term, this technology may be the future after the crash and burn.